Don't throw away your old, holey t-shirts! Turn them into something functional! I know there are lots of ways you can upcycle your old clothes... but when one of my favorite old shirts had finally seen it's last wear, I decided to cut it into strips & crochet it into a set of coasters. I sent the coasters to my parents for testing & they LOVE them. In fact, my mom has me crochet more of them when her shirts get worn out. I like to make mine square, but you can make them any shape you like. Supplies: Old cotton t-shirt, Size N or P crochet hook, scissors. Prepare your old shirt by cutting off any seams, bias tape, etc. Then cut your shirt in one continuous 3/4 - 1" strip. I cut mine around and around in a "spiral" so that I don't have to tie individual strips together. Row 1: SC in 2nd CH from hook & in each CH across, CH 1, turn. Row 2: SC in each CH across, CH 1, turn. Repeat row 2 until your piece is square. Fasten off & tuck in the ends. Trim any pieces of shirt that stick out, or leave them... Whatever you think looks best. What an interesting idea! Can't wait to try it out! it is a really slick way to cut the t-shirt round and round very easily. 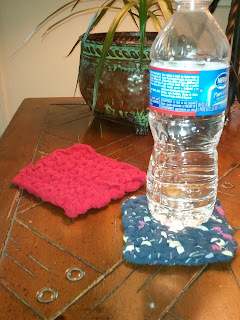 I have not made coasters yet but have made tons of rugs with the t-shirt yarn. Do you have a video on how to do this? I am trying make these and i just need to see how it is started. Thank you!